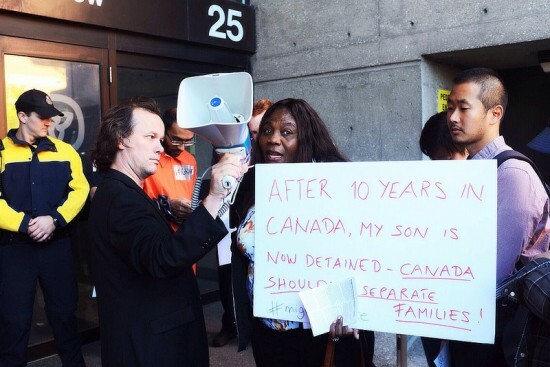 Lynval Daley has been in immigration hold for three years while Canada attempts to deport him to Jamaica. As a refugee claimant who came from Nigeria more than nine years ago, Azuka Abagbodi was detained upon attending his monthly visit with immigration enforcement in August 2012. He’s since been deported. All three currently are or have been detainees at the Central East Correctional Centre (CECC) in Lindsay, Ontario with other migrants. Pending deportation, they remain in immigration hold, separated from their families, unable to access legal counsel, and facing constant lockdowns. They’re deemed flight risks and detainedfor overstaying their visas or permits, or for having their permanent or refugee status revoked. Like failing to pay a parking permit or filing taxes on time, these migrants are only accused of an “administrative offense.” But unlike those other offenses, these are some of the only ones which lead to detention. 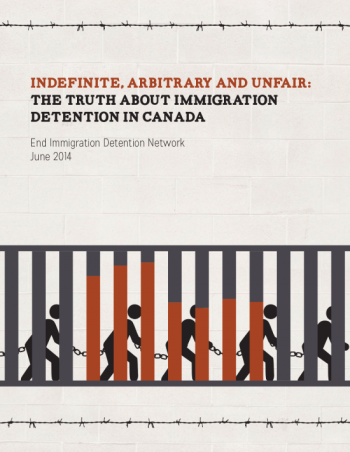 Today, a report entitled “Endless, Arbitrary and Unfair: The Truth about Immigration Detention in Canada” is being released by No One is Illegal — Toronto and the End Immigration Detention Network (EIDN), a coalition of migrant detainees, family members, and allies fighting immigration detention. The report fleshes out the motivations for a month–long boycott begun last week today, on June 2nd, by over 100 migrants detained at the CECC, the Central North Correctional Centre in Penetanguishene, and Toronto’s West Detention Centre. They’re boycotting the empty promises of their detention reviews, where migrants “appear before an appointed ‘member’ of the Immigration and Refugee Board’s Immigration Detention division within the first 48 hours, then seven days, and subsequently every 30 days after their detention begins,” according to the report. Over the years, the authors of the report note, a rapidly decreasing number of migrants are released upon attending these meetings. Using government documents obtained through Access to Information and Privacy Act requests, the report found that release rates also vary widely — between five and 38 per cent — for individual decision makers. Valerie Currie, for instance, ruled on 443 detention reviews but only released 21 migrants (a five per cent release rate), while Maria-Louise Cote oversaw 303 and released 100 migrants (a substantially higher release rate of 33 per cent). The report details regional variations as well. The chances of a detainee being released in the central region (Ontario minus Ottawa and Kingston) is nine per cent, while the chances of release are 24 per cent in eastern Canada and 27 per cent in western Canada. In the five-year period 2009 – 2013, detainees were held for ten days in Pacific Canada but were jailed for 38 days in Northern Ontario. The detainees are currently boycotting this sleight of hand. 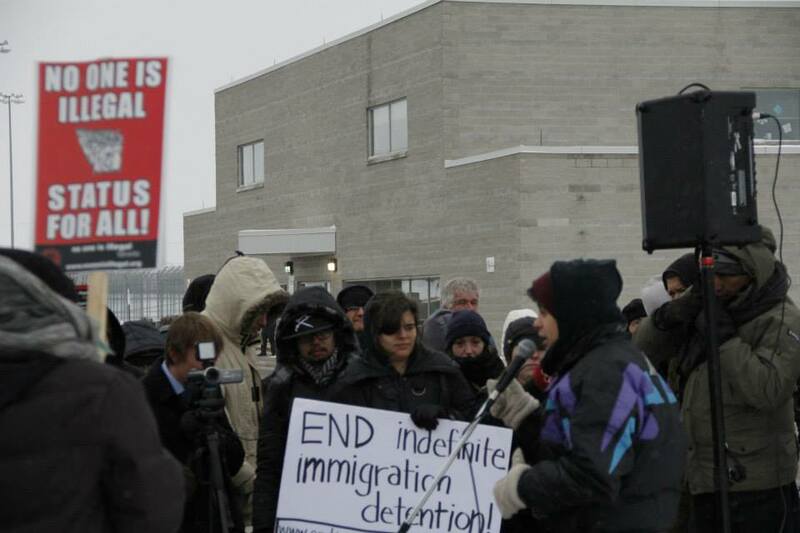 On September 16 of last year, 191 detainees at CECC similarly staged a hunger strike to confront indefinite detention. Facing solitary confinement lasting between 23 and 24 hours for striking, and prevented from showering for as long as a week, detainees persisted to the point that some, like Mjasiri, lost 42 pounds in the first 43 days of his 65-day strike. They agitated against a form of migrant treatment that is not only unnecessary, arbitrary, and indefinite but increasingly widespread. 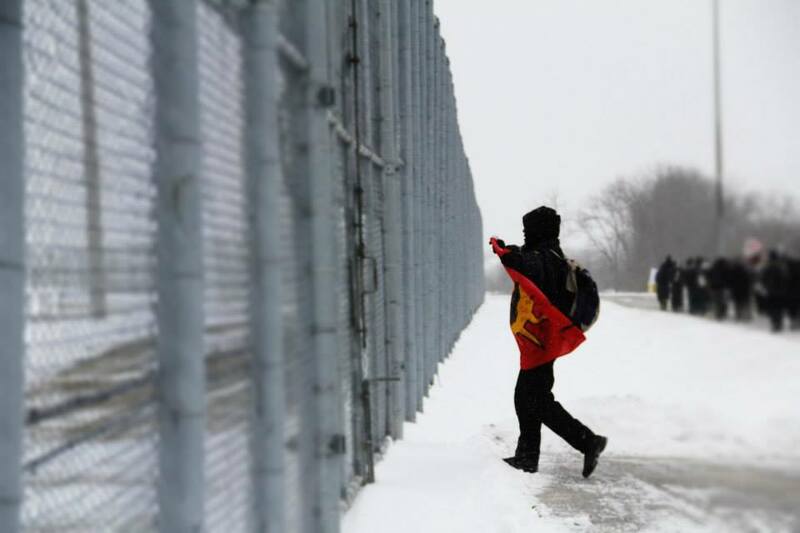 While there are three official immigration holding centres in Canada, last year 142 facilities throughout the country were used for this purpose — ith some being maximum security prisons. The budget for immigration enforcement ballooned from $91 million to $198 in 2012-2013, while the immigration detention budget sits at over $45.7 million per year. In the same period, 9,571 migrants spent time in immigration hold. Hundreds of children per year are also being detained, though the number could be higher since children are not counted as detainees, but rather as “accompanying their parents”. All these facts and experiences — the worsening outcomes for migrants at their detention reviews, the indefinite detentions, the deportations — are ultimately the culmination of a series of deliberate policies. In 2010, using the Sri Lankan asylum seekers who reached the shores of British Columbia on the MV Sun Sea as a pretext, the Harper government introduced “anti-smuggling” legislation which enforced a mandatory 12-month detention period for “irregular arrivals.” The Public Safety Minister, Blaney, would have the power to designate migrants as irregular if he suspects, for instance, that processing their case would take too much time. As these legal changes accelerate, and as anti-migrant sentiment among Canadians sharpens, the reasons why all of this is happening is still open to debate. Anti-immigrant discourse, far from excluding new (im)migrants from coming to Canada, has enabled national states to reorganize their nationalized labour markets in order to include a group of ‘temporary foreign workers’ who are made vulnerable to employers’ demands through their subordinated status as ‘temporary,’ as ‘foreigners,’ and as legally enforced unfree workers. The same economic considerations which Sharma details are influencing the expansion of immigration detention, according to another researcher. “I think that part of the neoliberal containment state is the presentation of criminalization and incarceration as the alternative to working in a really exploitative low-wage job,” says Aiyanas Ormond, a community organizer for the Vancouver Area Network of Drug Users, in a phone interview with The Mainlander. “Either you accept the exploitative conditions, and the massive cuts to the social wage, or the alternative is criminalization and jail.” And that alternative is increasingly forced on migrants with the many changes to immigration over the years — changes which have, according to EIDN’s report, left 500,000 people undocumented in the country. According to Ormond, the neoliberal containment state also functions to repress emerging, if only nascent, resistance efforts. “People who are coming to Canada from Mexico to paint condos are in many cases the same people who are fleeing areas devastated by Canadian mining companies and militarized by Canadian corporate aggression in Mexico or in the Philippines,” Ormond says. “I think that does present a serious threat to both the ideological justification of the neoliberal state and also materially in the sense of a potential organized force.” As a result, according to Ormond and other researchers, the Canadian state preemptively ramps up repression and criminalization of potentially organized and emboldened migrants. But regardless of the potential explanations, the facts remain indisputable. Migrants accused of nothing more than an administrative offense are being detained indefinitely in facilities throughout the country. Rather than being able to stay in a country that many of them have lived in for years and sometimes decades, they are imprisoned. The detention review is a sham, with fewer and fewer people released over the years. And there’s almost surely political interference from legislators prepared to exploit migrants for gain. Those detained today recognize the difficulty of their situation. Despite it, or maybe because of it, they boycott.